“You are a project manager? Yea, don’t bother moving here you won’t find a job”. As we finalised arrangements for the winter and sorted out the not inconsiderable financial commitment, the unthinkable happened, we had two offers on the house within the space of a week. As we couldn’t pass up the chance to escape snowless Nova Scotia, the plan to spend the winter in the Yukon on a temporary basis had to be shelved as the hunt to find a house, in very quick order, began. Unable to find a suitable permanent property in the Yukon we focused our search on British Columbia. Anyone knowing their geography will realise that BC is a huge province so we elicited help by getting in touch with Hans Gatt (clang) a former resident of Atlin, BC. His partner, Susie Rogan (not sure that is worth a clang but as she has just finished third in the Percey De Wolfe maybe a clink) replied suggesting that a move to the remote north of BC was tantamount to guaranteeing cabin fever and/or mental illness. As my mental (in)stability had been seriously questioned by friends the previous winter we decided that northern BC may not have been for us. As such I set off to explore Alberta and central BC, eventually, on the recommendation of Karen Ramstead and Warren Palfrey (clang, clang, clang, clang) settling on the Quesnel/Prince George area. However time was running out, winter was getting close and the prospect of moving the entire kennel across Canada at short notice was pretty daunting (the road trip alone takes about 8 days without having dogs/kennels/possessions in tow) so when I struggled to find a suitable mushing property in BC we turned our attentions closer to home. 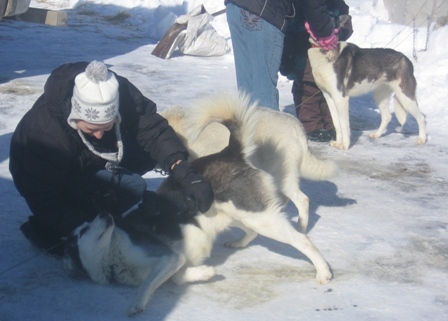 To cut an extremely long story short, on the 21 October 2009 we pulled out of a month long nightmare (probably the worst 4 weeks of our lives) and into the former Edmundston Zoo, the new home of Shaytaan Siberian Huskies on the New Brunwick/Quebec border. Not exactly the final frontier, but bandit country nonetheless and a few of the locals even speak English. Despite the fact that training was going well the late start to training, November instead of August, meant that we were well short on miles in the run up to Eagle Lake; we only had about 250 miles on the dogs. We were putting in some pretty fast 16 to 20 mile training runs, often averaging 9.5 to 10 mph for the entire distance, but when I increased the distance to 25 to 30 miles the speed dropped off quite dramatically. Eagle Lake had been the scene of my one venture into the longer mid-distance arena when I took part in, and finished, the Eagle Lake 100 mile race two years previously; as such I knew how mountainous and difficult the race was going to be. What’s more, falling as early in the winter as it does, it is an extremely tough race for six-dog teams, the maximum number allowed in this particular 30 mile race. As race day got ever closer I bored anyone who was prepared to listen (and many who weren’t prepared) telling them that the race was coming round three weeks too soon for us and that we were going to struggle to finish with a respectable time. Louise tried to placate me by using the quality over quantity argument, we were training over some pretty mountainous terrain, but I was confident that we were at least 150 miles short of being a team capable of finishing the race in a competitive, middle of the pack manner. of a race...and it was. By the time Brownville was on the radar we had between 350 and 400 miles on most of the dogs and had added over 150 training miles since Eagle Lake. More importantly we had run a series of 25 to 30 mile training runs and were now covering the distance regularly at an average of 9.5 mph; I was starting to feel much more confident in the team’s ability. chew their way out of Alex Murphy’s dog truck – our own van terminally ill and stuck at Alex’ camp. This was only an eight dog race but as I was not sure whether I would need fast, lithe leaders or solid, strong, reliable leaders I had brought 9 dogs with me with the intent of running either Cassie or Medea depending on conditions; I had planned on making the decision at the now missed mushers’ meeting. Misinterpreting the trail advice given by the race marshal who I had hunted down in the car park I went with the faster Cassie; a decision that proved to be our downfall on many levels. Almost straight out of the start chute Cassie started necklining, a sign that she had, as I had suspected, a minor injury picked up in training earlier in the week and that I had failed to address properly. I slowed the team to compensate but was not helped by the fact that the trail was extremely mountainous and the snow pretty soft and punchy; I really should have run Medea instead. Keeping the speed down so that Cassie could remain in the team I was in fairly disconsolate mood when we crossed the finish line after what turned out to be 26 miles of hell. My mood wasn’t improved when I got back to Alex’ truck to discover that Medea, having been left behind, had done her best to follow the team by eating her way out of the truck. All this and we still faced the prospect of at least 6 hours on the back of a tow truck in order to get that bloody van home. I guess all love affairs have to have their rocky moments. This was to be our third year running at L’Odyssee, a race that was only in its fourth year; it is by far my favourite race of the year. 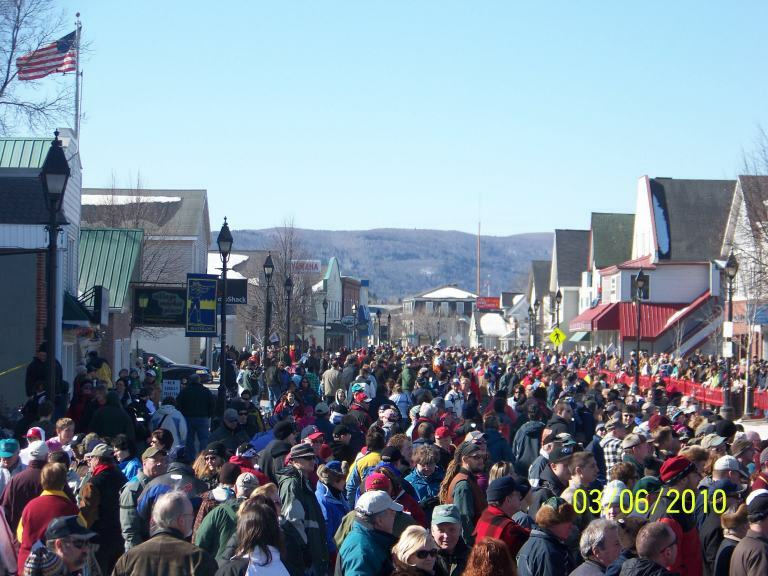 Starting in downtown Saint-Pamphile (how Petula Clarke of me) the race embraces the whole region and hundreds of spectators turn out for the race weekend. 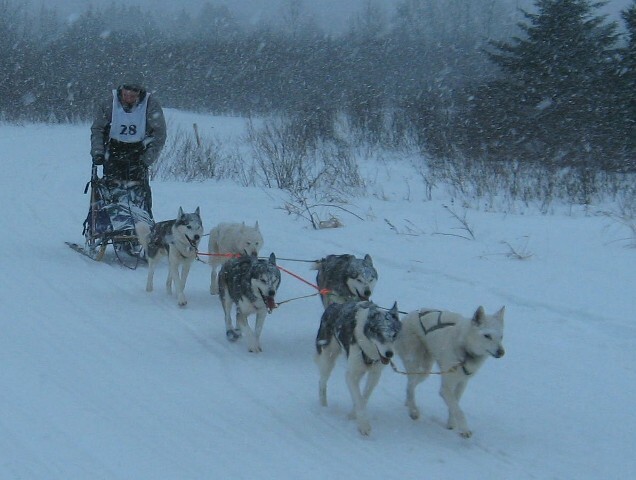 Siberians are becoming more and more scarce on the Quebec race circuit and the previous two years we have been one of only two Siberian kennels to enter teams at Saint-Pamphile, as such we always seem to have a big crowd of followers who want to see ‘proper’ huskies. This and the fact that the organisers and volunteers are super helpful makes this feel like such a special race. 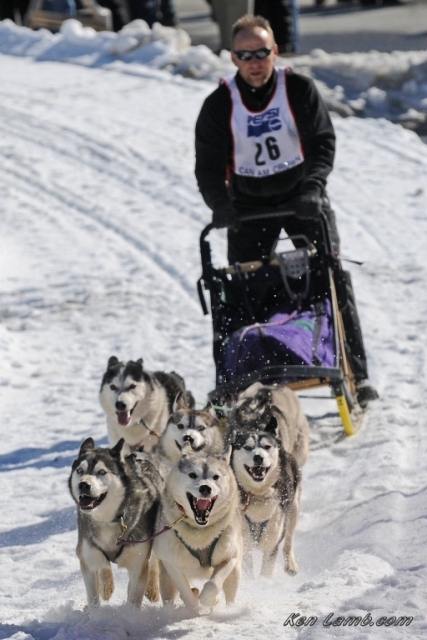 ﻿During training leading up to L’Odyssee, our youngest dog in training, Dawson, had been doing extremely well and I really wanted to include him in the 12 that I forecast would be racing in the two teams we would enter in our biggest race of the year, the forthcoming Can Am 30. Unfortunately Dawson can be a bit nervous around people and as you can often get 3000 spectators lining the start chute and first ¼ mile of the Can Am, I wanted Dawson to have some race exposure before such a big event. During a run in late December Dawson had suffered a bad bout of stress diarrhoea and so I had given him a three week break from training which ensured he made a full recovery but which put him about 250 miles behind the other dogs and out of contention for our first three races of the winter. Although a fast, two-day race wasn’t an ideal start to Dawson’s race career it was better than dropping him in at the deep end at the Can Am. 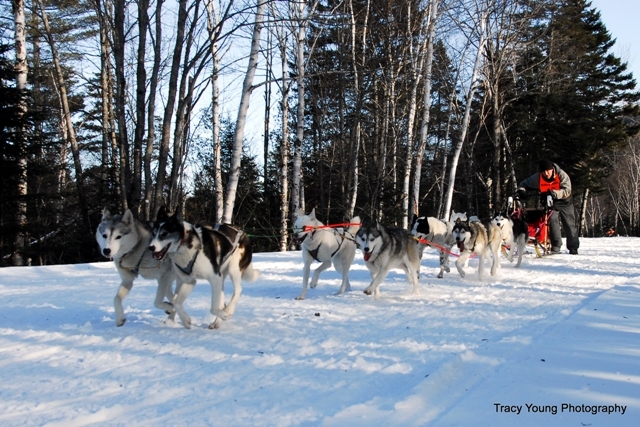 So as it was Dawson was on the ten-dog team that careened out of the start chute on Day One of L’Odyssee. ensured the red lantern but also cost me $660 in prize money). Unfortunately being against such strong opposition, and not wanting to be entirely humiliated can do strange things to the mind, and mine is a strange mind indeed. I had planned to pace the dogs over the two days safe in the knowledge that the lantern was already mine. Race plan seemingly forgotten we set off hell for leather intent on getting round as fast as we could and as close to the team in front as was Siberian Huskily possible. Aided by a fast and relatively flat trail we were flying. Approaching the turn at half way (another out and back trail with head on passing) we were travelling at just under 12 mph, far too fast for us at a two-day race and well off the race plan. Although I knew that I would suffer on day two, stupidity reigned supreme and I pushed on at speed, finishing the day at just under 10.5 mph, very creditable for us but very dumb. What’s more the run hadn’t been without incident, Dawson had been showing signs of holding back on the final couple of miles, something that I failed to act on the next day – to the team’s cost. Over the course of the following morning a couple of us gave Dawson a thorough examination but could find nothing significant barring some light abrasion on his pads. Convincing myself that a set of boots would sort him out I foolishly resolved to run him and so started Day Two with a full complement of ten dogs on the lines. We set off where we had left off on the previous day – travelling too fast. 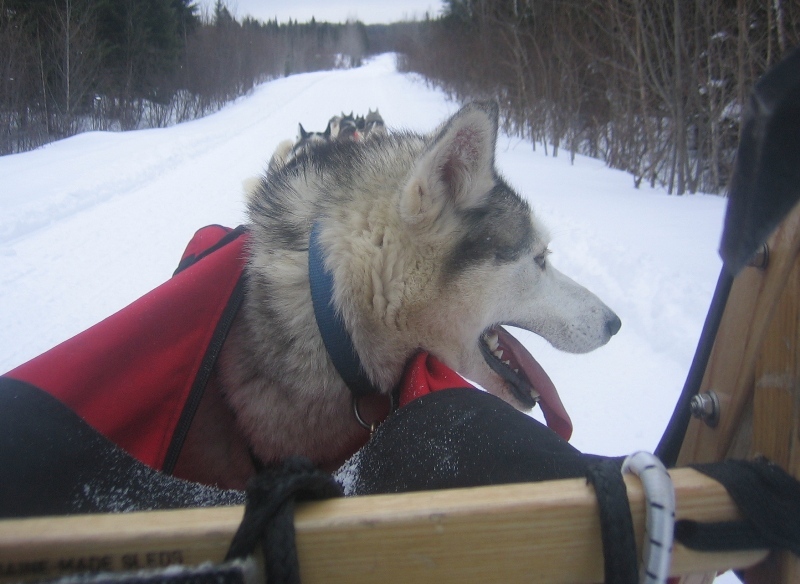 Unfortunately from the start it was obvious that Dawson was not happy and by the time I made the turn at half way to run for home I had little choice but carry him in the sled bag. before the race that we actually received a message asking if Louise also still wanted to race as someone else had dropped out. high street climb from a balmy 32°F to a positively huskily non-conducive 38°F – and it was still climbing fast. This could be a hard race. I barely registered as all the talk of food had really turned me off, was that there was a stretch of trail, claimed to be about 450 yards long, that went through a logging area that had been clear cut and so the snow conditions weren’t the best, safe, but not the best. I let it pass over my head resolving to take what was thrown at me on the trail. average 20 minutes faster than me at most races. Really pleased with our performance I sat back in the sun, sipping ice cold beers and BS’ing with good friends and waited for Louise to finish; how could I not love mushing. And that would have been a good place to finish the story of the race however the race organisers made good on their assertion that they would heavily penalise anyone who wasn’t carrying the correct equipment. Over the course of the weekend 5 mushers were given time penalties for not carrying enough emergency food at the end of the race. In one case Jacques Trottier, the winner of the 30 mile race, was penalised 15 minutes for being ½ lb under weight on his food, 15 minutes that cost him two places and $750 in prize money. The same penalty for the same infringement was also handed out to Scott Alexander which meant we unceremoniously moved into the position of being the highest placed pure breed team. Not the way I would have wished to earn such an award and forever more I will cede that we were not the fastest pure breed team on the trail that day. At the awards breakfast the following morning musher discontent reigned supreme; many grumbles were audible when the announcer joked about Jacques’ absence/boycott of the ceremony and a round of applause greeted Genevieve Telmosse, the winner of the 30 by default, when she acknowledged that she had neither the best nor the fastest team in the race and that Jacques was the real winner. 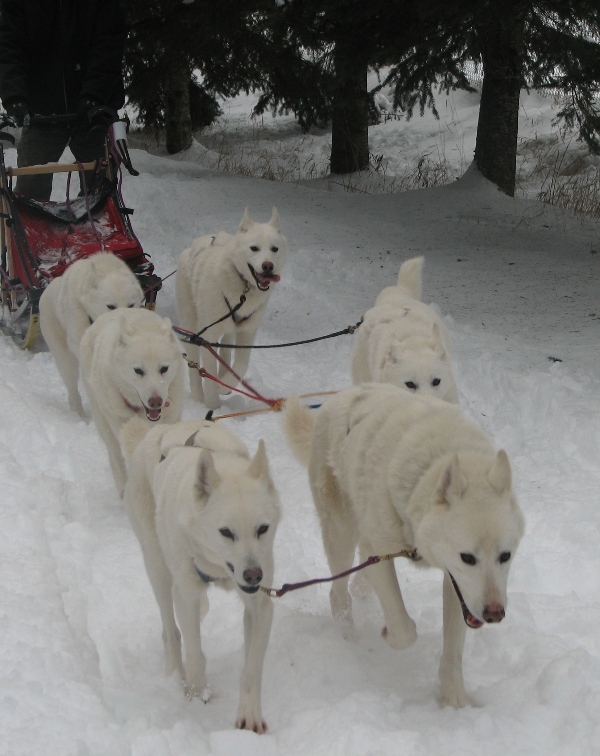 However mushers being mushers, all things being equal and nothing ever stays the same not all were downcast and some had fallen in love with mushing all over again, me being one of them. Anyway I can see a nice naked big beaver lying on the kitchen table and demanding my attention. I had better get my chopper in my hand and get ‘er done – the dogs do have to eat after all.